These test procedures are based on OIML R 59. 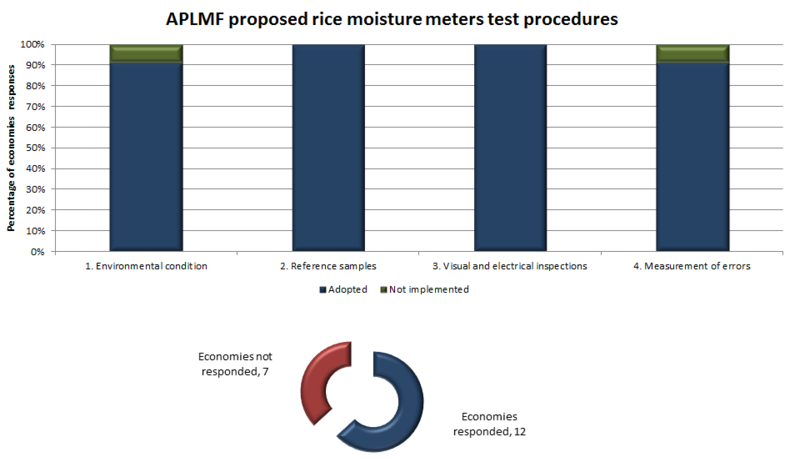 Please note tests used to compile this summary are fully described in the document APLMF Guide 6 - Guide on Rice Moisture Measurement. ​The room temperature is in a range from 20 °C to 30 °C (with stability within ±1 °C). The relative humidity is in a range from 30 % to 70 % (with stability within ±5 %). Place the moisture meter under test (MUT) and reference samples at the constant environmental condition at least 3 hours before the test. ​Prepare a set of reference samples of rice with different levels of moisture content (5 levels or more). The above levels shall include a range of moisture content from 10 % to 20 %. Each sample shall be homogenized. The reference values of moisture content of the reference samples have been measured in advance with a reference (dry oven) method or a primary standard moisture meter. There are no damages in the housing, display and sample holder. LCD (liquid crystal display) functions correctly. Instrument temperature agrees with the room temperature within ± 3 ºC. Battery voltage is within a normal range (use a self-checking function). Electrical performance of the meter is normal (use a checker-kit). Measure moisture contents of the reference samples using the moisture meter under test (MUT) at different levels (5 levels or more). Repeat at least 5 measurements at each level of moisture content. Averages of the measurement results agree those of reference samples within MPE (maximum permissible error) specified by the national/regional authority. This report is unavailable for rice moisture meters.